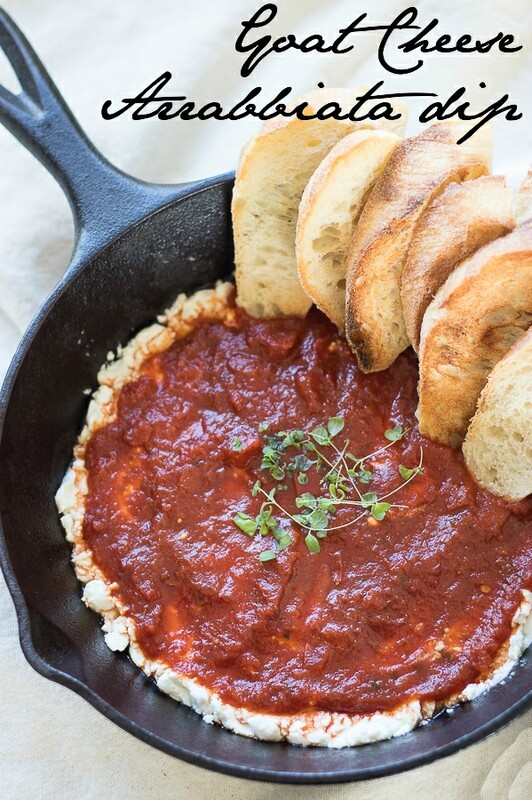 You need just 3 things for this Goat Cheese Arrabbiata Dip – goat cheese (choose a creamy version, like Chèvre), a jar of Arrabbiata sauce (you could make your own, but this is supposed to be easy!) and a baguette. Step 1 – Slice the baguette thinly and broil it in the oven for a few minutes on each side until golden brown. Step 2 – Spread goat cheese in the bottom of a baking dish (I like to use a cute skillet) pour sauce over top and bake at 400 until bubbly and warm. Top with chopped herbs if you want to be fancy. Step 3 – Try not to double dip, it’s so good! 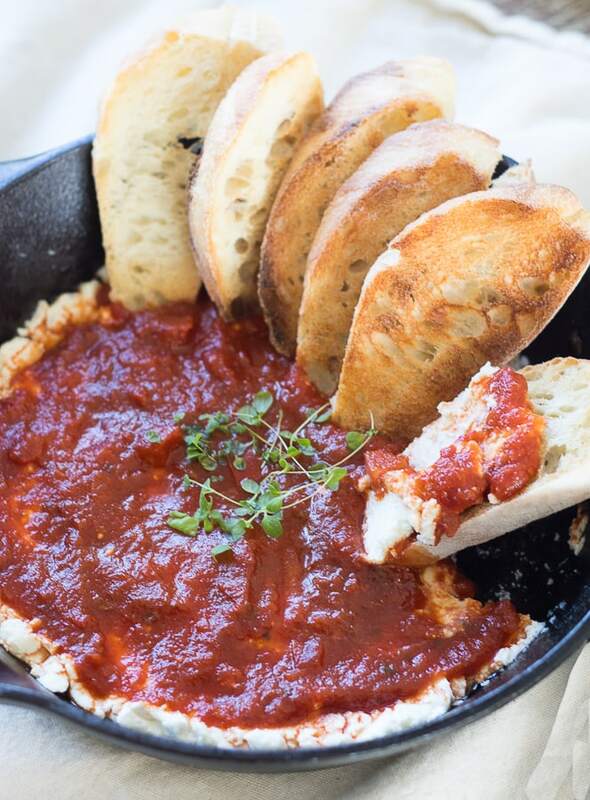 The creamy goat cheese, spicy sauce and crunchy bread is perfection. Now that you have an easy appetizer how about some good books to go along with it? I absolutely love to read, and it’s a total stress reliever for me. My mom took me to the library once a week when I was a little girl and the habit has stuck with me, and now my kids too. A Man Called Ove: A Novel – My cousin Betsy recommended this book to me and I loved it. It’s about a cranky old man named Ove. Which I’ll admit doesn’t sound like a page turner, but it’s the type of book where you miss the characters when they are gone. Also if you don’t cry at the end you basically have a grinch heart. Beartown: A Novel – This was written by the same author as A Man Called Ove, Fredrik Backman. It’s about a Hockey team, which it took me a minute to get into it, but again the characters he writes are so heartbreaking and endearing. Little Fires Everywhere – Ok this one I haven’t read yet, but my mom is halfway through and she put it on my must read list. She rarely steers me wrong when it comes to books, so I’m anxiously awaiting her to be done with it. So grab your own copy and we can read it together. Parenting With Love And Logic (Updated and Expanded Edition) – this book has been a great parenting resource for me lately. I read it a few years back, but it’s been super helpful now that we are navigating the tricky tween stage with my head strong daughter. It’s all about teaching your kids responsibility and letting kids feel the consequences of the choices they make. Satisfied: Discovering Contentment in a World of Consumption – This is a book that our pastor Jeff Manion wrote. We went through a whole sermon series last year when we read it. It’s a great book about contentment and being happy where you are at. Jeff is also going through an awesome sermon series called Choosing Joy Under Pressure right now, which with all that’s going on in the world, could not come at better time. You can listen online here. I refound your blog last week, and spent several happy evenings reading about your new house adventures and some of the old house. I loved the old house, but the new one blew me away, wow! You made me smile, when you do your projects when the Mr is away, so he has to like them. Years ago, when we were newlyweds my handsome told me it was better to ask for forgiveness then permission. Well, I think he is sorry He said that, as I have taken it to heart and use it often. I bought some French chairs at the auctions and put them in the room of shame aka back room and keep forgetting to ask for forgiveness. It is all in the timing haha. Like you, I Love to read and find it very relaxing and nessacery for my wellbeing and happiness. Thanks for the great book suggestions. I will be definitely checking out the parenting with love and logic, as I also have a strong willed daughter, who loves to give me a run for my money. Have a lovely weekend. Thanks Relle, I’m glad you happened upon the blog again :) Love and Logic is a great book for the strong willed kiddos out there! That appetizer is almost too pretty to eat, lol! And thanks for sharing the book list. i love your friday series! that appetizer looks like it was meant for me. Easy. Thanks so much Laura, yes this is the easiest! I will try the appetizer! Sounds delicious! Thank you for the book recommendations! I just requested the Parenting With Love and Logic book from our library system. I read it awhile ago and need a refresher. It’s always a great book to refer back to, it really works when I manage to remember the suggestions in the moment! Just a suggestion I am legally blind and I do like some new recipes … my issue is this. You print the recipes in a light grey …. so very hard to see. is it possible to have a bold black or bold navy??? Thank you and God Bless!!! Hi Dee, I finally got it switched to black today! I’ve been having trouble with this for a few months, my tech guru took care of it today. Hopefully next week will be a better reading experience for you! Beartown and Ove are two of the best books I’ve read in years. All the other books by the author are great as well! Will definitely read the rest! I just ordered his other books, can’t wait to read them! Can’t wait to try this appetizer. Sounds delish! We are goat cheese fanatics around our house! We are too! It’s so good! Love your blog. Your new home is spectacular. Hope you can use a darker text color, I also have trouble reading the light gray text. Hi Lois, sorry about that I’ve been trying to fix it for a while, there was a weird piece of code blocking the color change. I finally got it all fixed! I enjoy your blog but also have trouble reading the light gray print. Sorry about that Kathy, it keeps reverting back to grey even though I switch it to black but good news, I had my tech guru look at it this morning and she got it fixed! For those having trouble with the light grey print on this lovely blog, you might try highlighting the post and copying it to a Word document (or Pages, depending on what program you have) then darkening and/or changing the font to something better for you. Hope that helps! I actually finally got it fixed to black and I think it’s going to work this time, thanks for a suggestion! Thank you for sharing! Everything is so delightful! Wondering, sounds like you are a Birn Again Christian? Happy Friday to you. Always love to see a post from you,you never disappoint. Am loving your new Friday posts!! Keep up the good work!! Thank you for the book recommendations. I started reading Beartown today. I love your style and thank you for all your sharing! Thanks Madeline, enjoy the book!